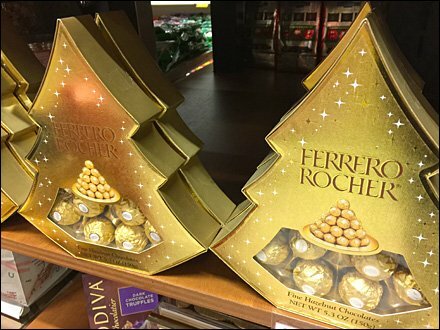 Ferrero Rocher does not normally leap to mind as a traditional Christmas Candy, but this Seasonal packaging may help launch the Ferrero Rocher Christmas Traditions trend. My wife loves the brand, Christmas or not. Rich gold packaging reinforces the always traditional Ferrero Rocher gold-foiled individual wraps inside. 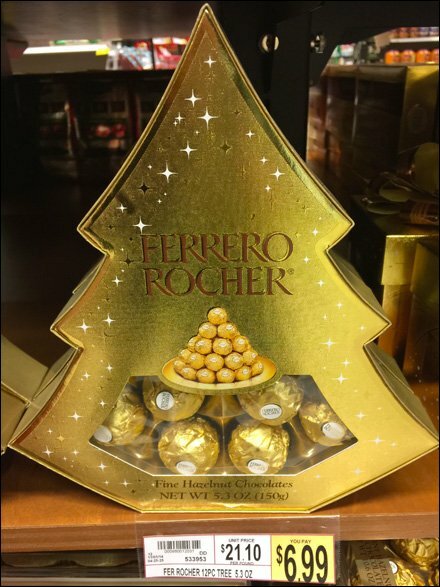 See the thumbnail to inspect the tree-shape package and the Ferrero Rocher Christmas Traditions gallery for various views and zooms. Get it before its all gone.